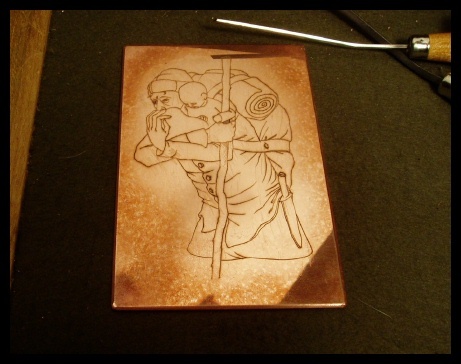 A small copper plate engraving of Saint Christopher in the early stages of cutting. If you shine the light and reflect a piece of white paper you can see the lines pretty well. It helps also to rub some polishing compound into the lines to darken them up. A burin and a lozenge at the top of the picture are the cutting tools.